Understanding subsurface currents is critical to trolling success. On large bodies of water, wind and bottom structure work together to create underwater currents. The collision of warm and cold water also creates current. Without a speed probe like the Fish Hawk X4, knowing what sub-surface currents are doing is nearly impossible. Newcomers to big water trolling often underestimate the effect on their lures. Trolled against the current, lures can wobble too fast or "burn out." Trolling with the current can leave your lure dead in the water! 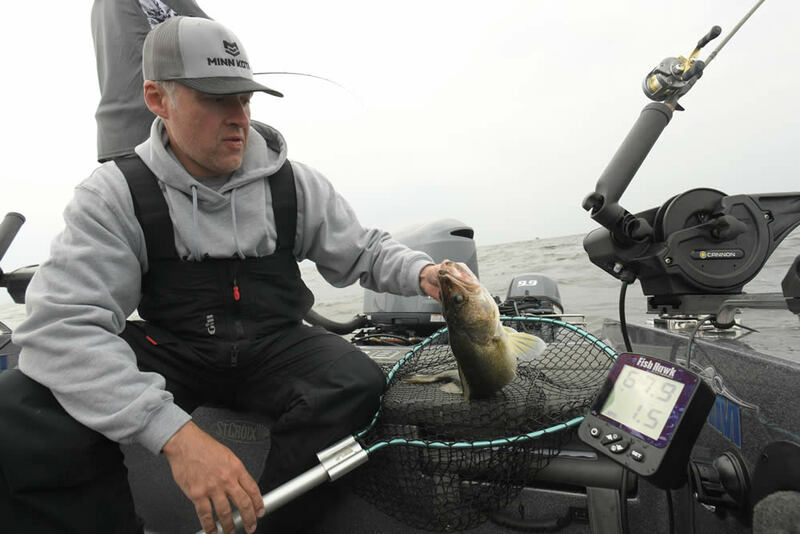 The Fish Hawk Probe relays important speed information from the downrigger ball to the angler. When trolling against the current, the angler must slow the boat down to keep the lure working at optimal speed; trolling with a current, the angler needs to speed up. Each style of lure has an optimal trolling speed. Good trolling spoons like Dreamweavers, Silver Streaks, and Michigan Stingers work over a wide range of trolling speeds. Flashers (or rotators) like the Spin Doctor, teamed with trolling flies also work over a wide range of speeds. Metal dodgers and plastic paddles with flies or meat rigs require slower trolling speeds. Plugs and crankbaits are speed sensitive and vary by make and model.